Last month in Chicago I covered one of my favorite sporting events: the Big Ten men’s basketball tournament. While almost everyone else I know doesn’t get a full case of March Madness until the NCAA Tournament begins, I get the fever a week earlier. During the third day of the tournament, I followed the producers, cameramen, sound guys and editors of the award-winning Big Ten Network documentary series ‘The Journey’ as they put together their hour-long season finale. In other words, I went behind the scenes with a show that has made its name going behind the scenes. The full piece ran on the homepage of Yahoo! Sports’ ThePostGame and the Shirley Povich Center for Sports Journalism. 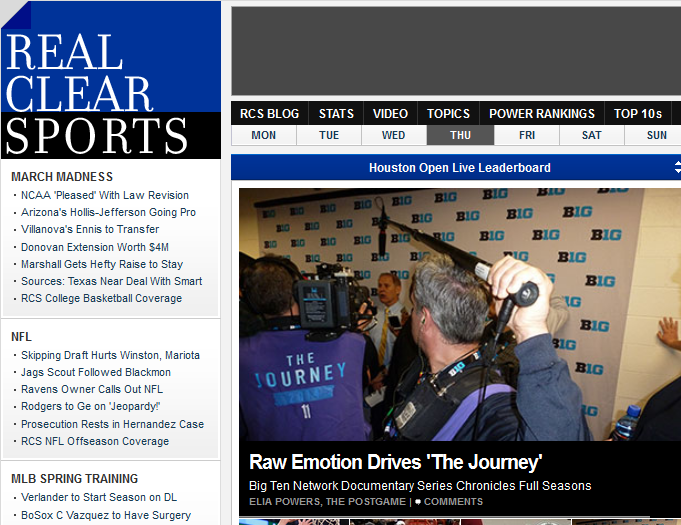 RealClearSports also featured the story on its front page. A coach whose last-ditch NCAA tournament hopes hinge on winning three games in three days tells his team “it is not a freakin’ option to get tired.” A coach whose team is safely in the field but fighting for a higher seed watches an upset unfold on television and has 24 hours to form a game plan. A senior sobs on the basketball court as he realizes his college career is over. A conference’s top player cuts down the net in the latest chapter of his storybook senior season. Capturing it all are cameramen wearing the broadcaster’s version of basketball warmups — sleeveless purple jackets emblazoned with “The Journey” and individualized numbers. These scenes from the Big Ten men’s basketball tournament in Chicago factor prominently in the hour-long season finale of The Journey, the Big Ten Network’s most-watched and critically acclaimed original series that chronicles Big Ten football and basketball. It’s easy to get lost in an increasingly crowded lineup of sports documentary programing that includes ESPN’s 30 for 30 series and HBO’s Hard Knocks. BTN’s signature documentary program doesn’t even have the market cornered on behind-the-scenes footage from this year’s Big Ten Tournament — Showtime’s Hoops U followed Maryland throughout March. The Journey has made its mark by canvassing an entire college sports conference in search of profiles that tell the story of full football and basketball seasons. It helps that the conference being profiled is known for massive alumni fan bases and just last year expanded from 12 to 14 universities, the newest of which, Maryland and Rutgers, are in the sought-after Washington, D.C. and New York media markets. On a Friday at the Big Ten Tournament that spanned 16 hours, eight locker rooms, four games and two bubble teams, The Journey’s production team discussed the show’s origins, editorial philosophy, production process — and what it’s like to put together an episode that captures the spirit of March Madness.